Trophies and rosettes for showing and competition winners! We are looking for a range of stalls for our event, anything that will interest the pet owner, and families. If you would like to apply for a stall please fill in the online form and we will contact you. Rosettes and trophies for winners! A weekend full of dog activities, Lurcher, Terrier and fun dog showing, have-a-go agility, have-a-go flyball, long jump and fastest recall competitions, plus stalls, archery, axe throwing for the humans. Everyone and anyone is more than welcome to come with any type of dog. You do not have to be a member of the forum to come and join in! Racing starts at approx 13.00hrs, and you book in and pay as you go onto the track. We try to make the day as reasonably priced as possible, so charge £3 per adult entry, and then £1.30 per dog per race. All dogs racing with other dogs must be muzzled, and muzzles are for sale on the day, costing £6-£7. We also have collections of useful items such as tinned food, treats, rice and pasta etc for the rescue at each race meet. The Epworth Experience on 15th & 16th September is a weekend packed with showing and activities suitable for dogs and owners of all shapes and sizes!! There is showing, have a go agility, have a go flyball, long jump competition, fastest recall competition and much more! There will also be Bushcraft classes with archery and axe throwing!! The event is to raise much needed funds for Lurcher Link rescue. 9th Pride of Peaks - Hartington Sports and Country Show Hall Bank, Buxton SK17 0AT. Champ lurcher gets a paul sullivan collar and lead set, stainless steel T bar and a bag of premium dog food . 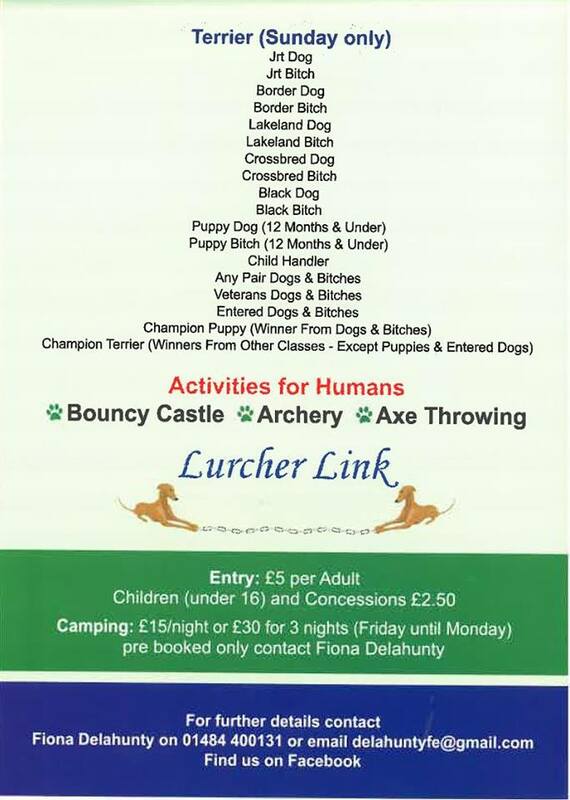 Lurcher, Terrier and Family Dog show in the afternoon starting around 1pm. Also, we will have the Mad Dogs running the Long Jump any breed of dog can take part, Trophy for the Longest Jumps from each of the three Categories. Join the greyhounds and volunteers from branches across the North of the UK for the 2018 Northern Greyhound Gathering. After a hugely successful first year at Wetherby Racecourse, the NGG returns there for 2018 with a host of trade stalls, classes, auctions, events, and activities for all the family. Free to attend, with a suggested donation for the Greyhound Trust West Yorkshire branch. Lurcher Link will have a stall here. Pop along and say hi. PLEASE NOTE THE MEETING ON SATURDAY 14TH JULY HAS BEEN CANCELLED DUE TO THE HOT WEATHER. Please can you pass this info on to anyone else that you know might have been going? It's not just the heat at the stadium, but the temperature for dogs travelling there and back which has made this decision necessary. Hopefully August will be cooler!